Fill a large bowl with ice water. Place another bowl inside so it's surrounded on all sides by the ice cold water. In a medium saucepan, bring water and sugar to a boil. When sugar has dissolved, remove from heat and add lime juice. Pour into bowl sitting in the ice bath to cool lime mixture, about 15 minutes. 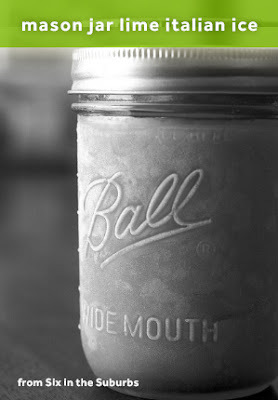 Pour mixture into mason jars using a ladle and put in the freezer. After 1 1/2 hours, remove from freezer and scrape the ice with a fork, being sure to mix the softer center with the more frozen outer edges. Put back into the freezer for another 1 1/2 hours. Before serving, scrape again using the fork.